Being a huge fan of German cuisine and heading to Berlin, I immediately signed up for Secret Food Tours Berlin, an award-winning company that runs foodie tours worldwide that I'd heard so much about. I absolutely love doing food tours, it's the perfect introduction to a new city and their local food, it ensures you try some of the very best, you get to learn all about it and it sets you up for the rest of your time there. I have done many food tours all around the world and this one was the most indulgent yet and my personal favourite. This lunchtime food tour is set in the popular and trendy East Berlin neighbourhood of Friedrichshain. Our group's meeting point was in front of the U-Bahn stop Warschauer, which was very easy to find and only a few stops away from where I was staying in Alexanderplatz. Once everyone had arrived, our lovely guide Becs introduced herself and told us what to expect from our upcoming tour. We also went around in the group and said where we were from, and what our favourite food was. We headed off on a short walk to our first foodie stop of the day, a local döner shop. 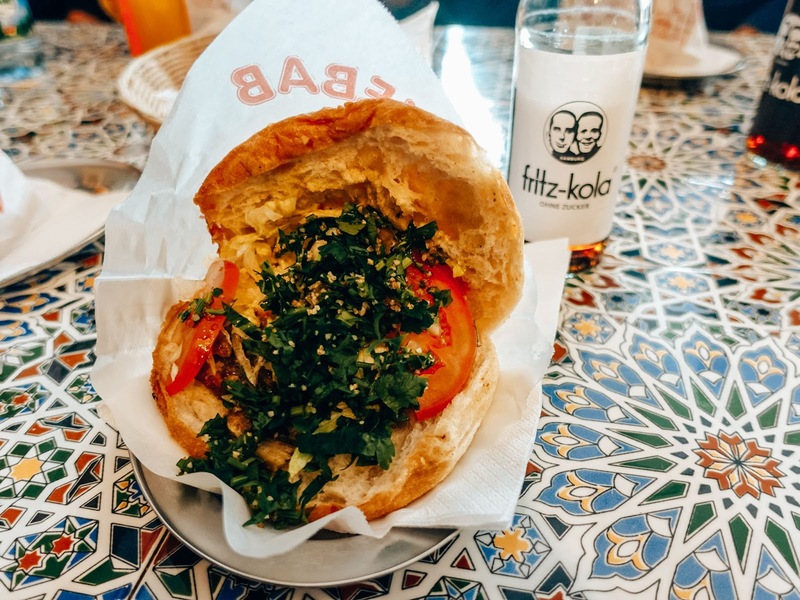 A döner or Berliner kebab is one of the city's specialities. 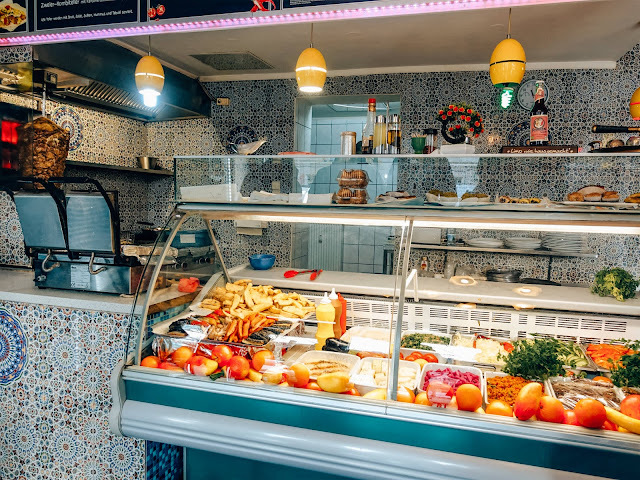 Developed in Berlin in 1972, it's an adaption of the traditional Turkish-style kebab and is a pita bread pocket filled with spiced meat, salad and sauce. The shop is owned by a local Turkish family and we could see ours being freshly prepared infront of us. We each got a chicken shawarma, with a mango-curry chutney, chilli paste, homemade hummus, tzatziki and salad. The warm, soft bread, the tender meat and the combination of flavours were incredible, it's definitely one of the very best I've ever had. I couldn't believe we got to have a whole one each, as just one is a huge meal in itself! I had to try very hard not to eat it all as I knew there was a lot more food still to come. We washed it down with a Fritz-Kola, a popular German soft drink. Our tour was certainly off to an amazing start. Next up, Becs took us on a pleasant walk through some cool alleyways with street art and graffiti. It was great to be shown a bit more of the neighbourhood and walking bursts between food stops are always welcome! We stopped at a trendy looking restaurant and bar where we got to order a beverage of our choice. Some went for coffee, others, like me, went for a beer. When in Germany! 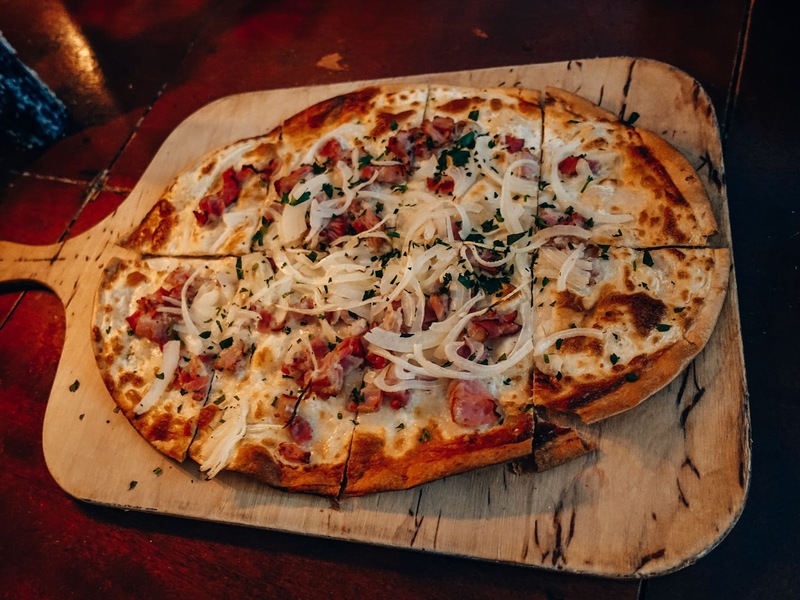 Out came an enormous slab of freshly baked flatbread pizza, known in German as Flammkuchen, meaning 'flame cake.' When most people think pizza they think of Italy, but Germans do their crispy and smoky pizza very very well. The thin, crispy crust was so light, and the ham, sour cream and onion toppings were very moreish. I loved it! When we were all ready to go we were off again for our first sweet stop of the day. I was super excited walking into a traditional Turkish sweets shop with the most amazing window display. 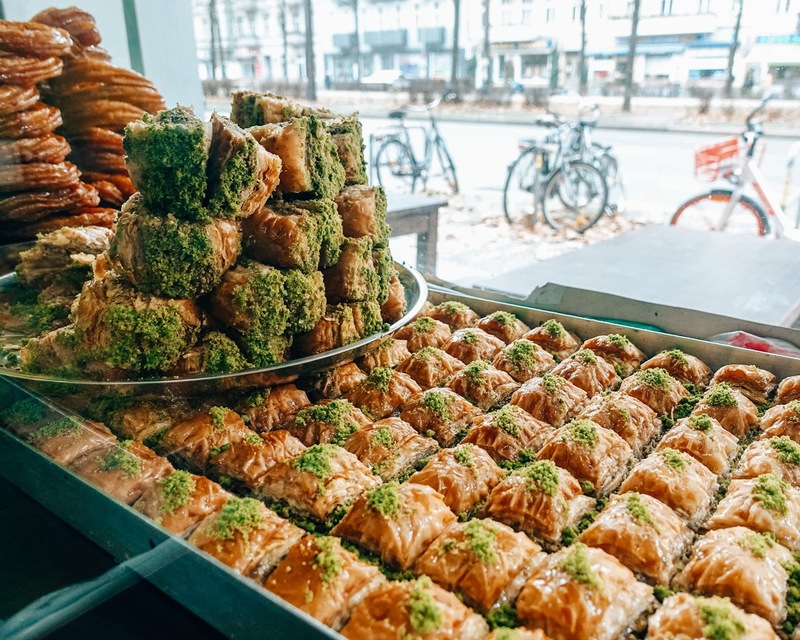 If you didn't know, Berlin's cultural mix is dominated by the Turkish community, which is the largest outside of Turkey. This brought the most excellent Turkish food to Berlin, including the best baklava I've ever tried in life! We had a very generous piece each which was melt-in-your-mouth delicious. 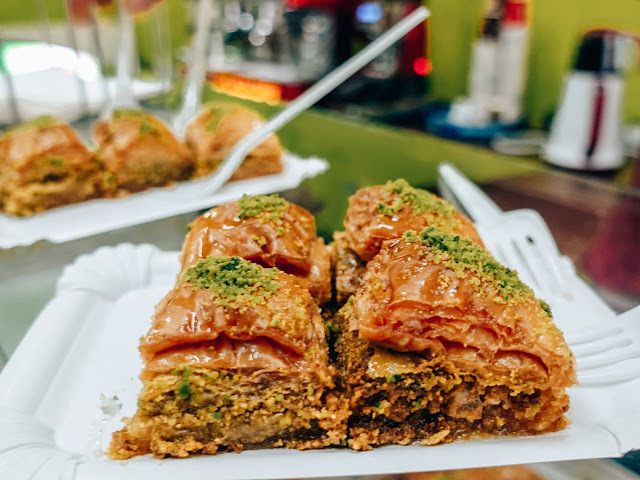 Baklava is a rich, and very sweet dessert pastry made of light layers of filo, filled with pistachio and sweetened and held together with a sticky syrup or honey. It was so good! Buzzed up on sugar, we continued on to another stand-up tasting of arguably Berlin's most popular street food, Currywurst. What would a Berlin food tour be without a Currywurst stop? 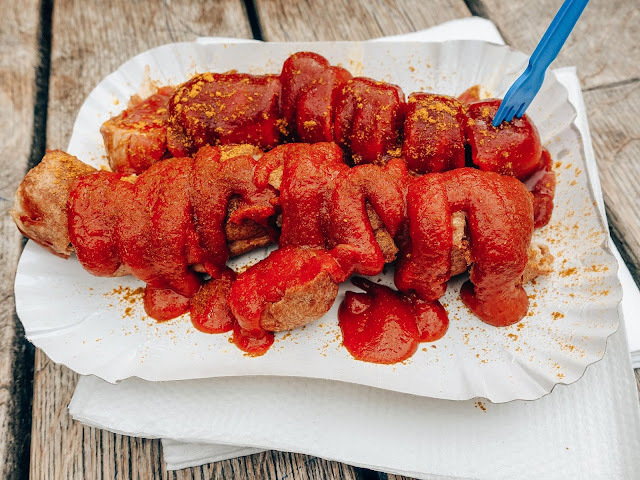 This typical snack consists of a fried pork sausage (or Bratwurst), cut into slices and seasoned with curry ketchup, with curry powder sprinkled on top. We had two different kinds to share, one was a slightly milder sauce and the other was spicier. Both were fantastic in my opinion! There were quite a few people lining up at the street stall so it was definitely a popular place to get it from. Off to our final stop of the day, we sat in a busy restaurant and bar which had a cool and sociable atmosphere. We could order another drink of our choice and I opted for a local beer. 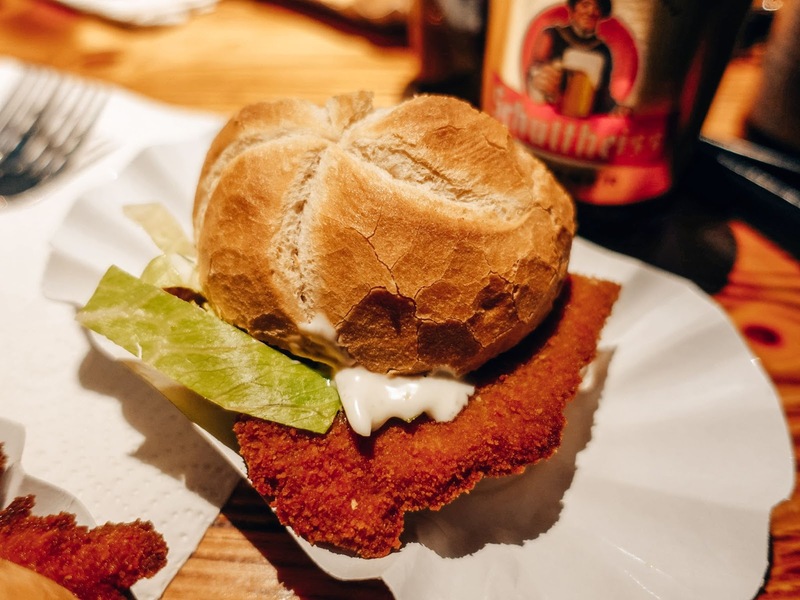 Out came delicious looking schnitzel sandwiches in a burger-style. The bread roll was crispy on the outside and soft on the inside, the crumbed schnitzel was juicy and the cucumber, lettuce and sauce pulled the whole thing together. Every bite was amazing! I was officially full to the brim by now but there is ALWAYS room for dessert and my all-time favourite just happened to come out! 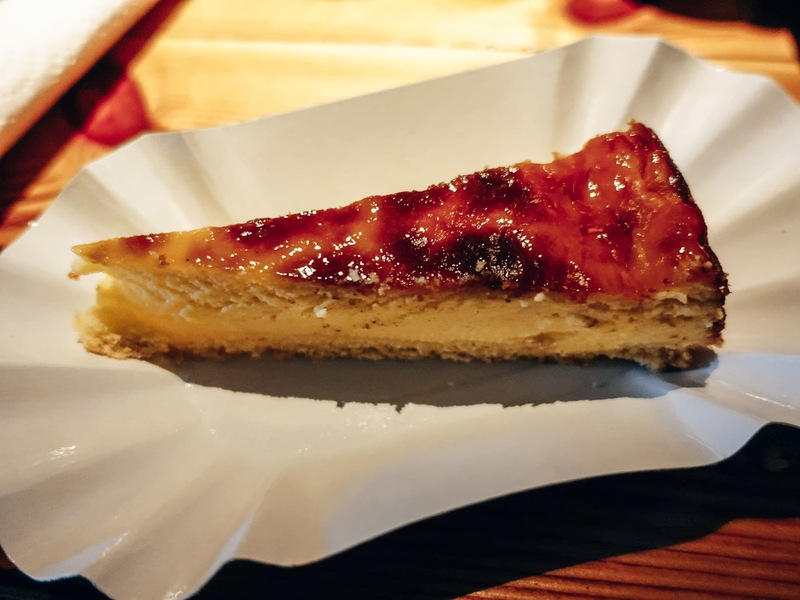 We finished off with a slice of Käsekuchen, which is German baked cheesecake. It was light, creamy and basically a gift sent from the gods. It was the perfect way to finish and everyone was highly satisfied after a fantastic three hours of trying so many highlights of Berlin's top cuisine. Becs gave us a handy booklet with tips and recommendations on the best places to eat for the rest of our time in Berlin which was a very nice touch. 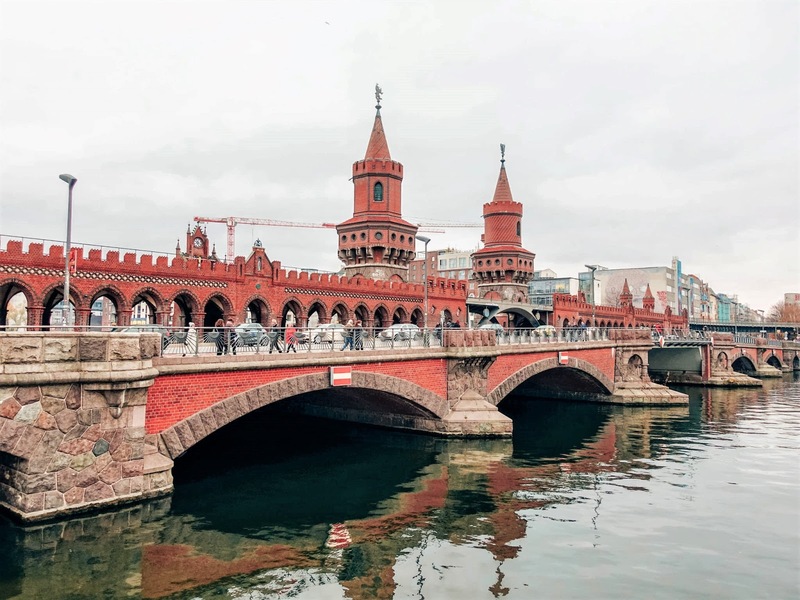 The tour ended directly across the road from Oberbaumbrücke, a red double-deck bridge crossing the River Spree. It's also the location of the very beginning of the East Side Gallery, which is the perfect activity to do after the food tour. 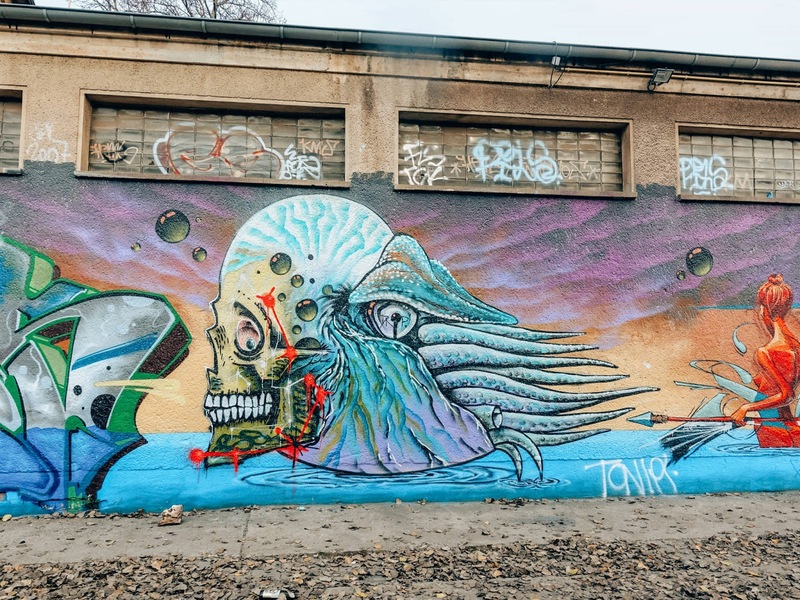 It's a protected open-air gallery along the longest remaining part of the Berlin Wall. The 1.3 kilometre stretch of murals are amazing, unique and hold a lot of meaning. If I were to create my own dream food tour, it would have been exactly this. 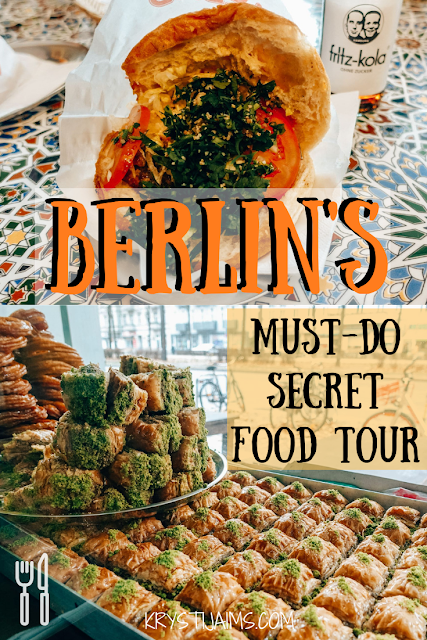 I could not have been more impressed by Secret Food Tours Berlin and I truly can't rave about them enough. I highly enjoyed trying such a variety of dishes from popular local spots and everything was so fresh and full of flavour. The tour was perfectly balanced, with just the right amount of walking between each stop and a good mixture of standing up and sitting down. I loved that each place was unique in its own way and specialised in what we were trying. Our guide Becs was fantastic, she was so friendly and informative, we all learnt a lot about the history of each dish as well as some great facts about Berlin throughout the tour. The generous portions make this tour excellent value for money, you certainly don't need to eat breakfast or dinner on the same day! I couldn't recommend this tour any higher, it was a fantastic foodie experience and a top highlight of my recent time in Berlin. Definitely check out their other tours offered all over the world too!